If you've never stayed at a Bed & Breakfast Inn you are missing out! Planning a getaway? Before you start checking the rates at the most popular hotel at your desired destination, we have a different idea for you: A Bed & Breakfast Inn. That's right, stay in a room at the home of someone who knows your destination best. Most people aren't quite sure what to think of a bed and breakfast. Either they have misconceived notions of the kind of service they'll get and the type of people who run the places, or they just have no idea how these quaint establishments function. The truth of the matter is, bed and breakfasts are different, but in a completely great way. Here are are some unique experiences you never realized you were missing out on. When comparing the average prices of hotels and B&Bs in major cities in California, the average hotel charges over $225 per night, while a B&B comes in at around $160 or less. That's over $50 less a night! Look at this delicious gourmet meal. We're pretty sure you don't get anything even close to that at your hotel's sad continental breakfast or local coffee house. Chances are, if you stay in a B&B, not only will you have free wi-fi, but complimentary parking and concierge services, too. Plus, while a hotel concierge might lazily direct you to a kiosk littered with impersonalized (and likely outdated) tourist pamphlets, many B&B owners are seasoned locals with a wealth of knowledge about the locale. Since these people were most likely born and bred in the town, you know they will happily tip you off to the best restaurants and things to do. Perhaps you have lived in the Central Valley of California your whole life, but you have never once have gone wine tasting. And maybe you really need to take a quick vacation but don't want to spend the money on plane tickets and hotel accommodations. Not all American B&Bs embrace a "quaint Americana" theme. You may enjoy a themed B&B that will transport you to another land far away with exotic cuisine and decor. Their attention to detail really makes for a uniquely warm, lush getaway without leaving the States. 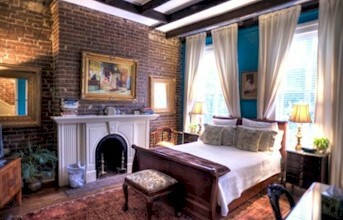 You will find most rooms at a B&B include a fireplace to keep you warm and make you feel more at home. Each room may also have a fridge with soda and an in-room coffee machine. And unlike most hotels, these drinks are complimentary, so no outrageous mini-bar charges. Many of the gourmet cooks at B&B's are Culinary school graduates or retired chef's from 5 star restaurants. 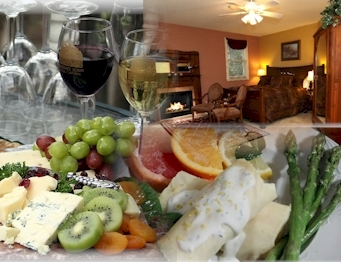 The service at a B&B goes way beyond just providing you with comfortable lodging for your vacation. The main difference between a bed and breakfast and a hotel is that the owners of a B&B see their patrons as guests, while hotels may see their patrons as customers. Many B&B owners will go out of their way to make sure their home adheres to many levels of comfort. 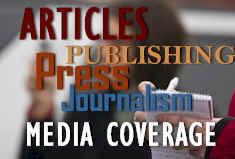 For example, they may have made sure to open their establishment away from loud freeways or roads, and they may allow guests to bring their pets if they want to. In fact, some B&B owners are willing to rent out their whole inn to a group for a weekend so they can have a fun get-together. 1727 Main Street, Napa, California We had a lovely stay at the The Hennessey House, which is located in a residential district at the top of restaurant row in Historic, Downtown Napa. 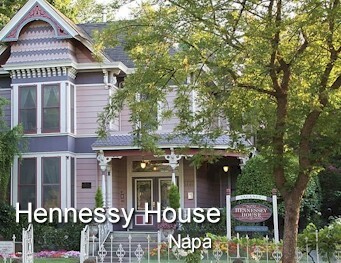 It was the home and office of Dr Hennessy and has been preserved over the years to maintain it's original charm and grandeur. We were able walk out the front door and enjoy fine dining just few blocks away in downtown Napa. We stayed in the Carriage Room, which was at one time, just that, where the horses and carriages were kept. Our room had been beautifully revamped into a luxurious, spa type environment with a fireplace and Jacuzzi tub. 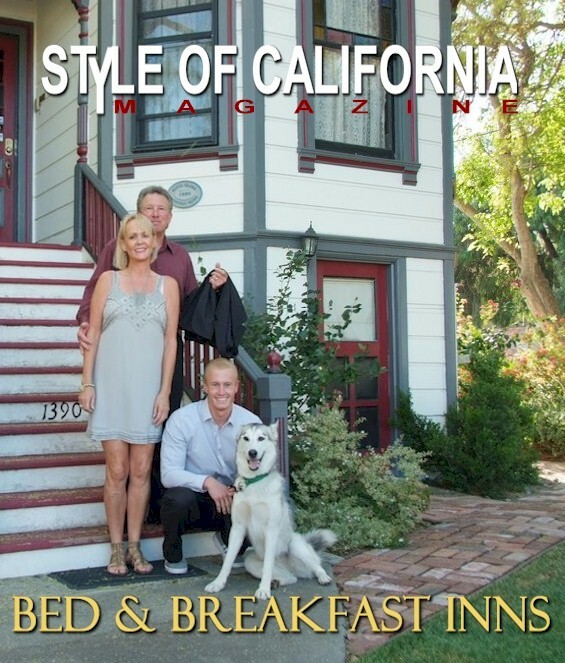 We enjoyed meeting the Innkeepers Kevin and Lorri Walsh, who 10 years ago, were living high powered (and high stress) lives in Silicon Valley and traded it all to run this beautiful relaxing Bed & Breakfast Inn. A social of cheese crackers and wine are served from around 5 to 7 pm. This gave us the opportunity to meet some very interesting people from Chicago, IL and Canada, who had traveled here with their families to escape the extreme freezing temps of the East Coast this time of year. 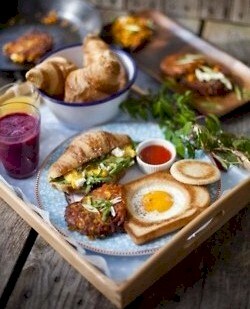 A gourmet breakfast is served in the dining room from 8 to about 10 a.m. giving another opportunity to meet and share a delicious meal with new found friends. The Inns Keepers were especially helpful when planning our day and directed us to interesting sights off the beaten path as well as hooked us up with some friends that owned local wineries for free wine tastings and tours.